The increasing simplification of the major NNW-SSE land division reaches its conclusion in the mid-2nd century, with the replacement of Period 3A-B ditches 25026 and 25006 by single continuous ditch 25021 (Figure 101). The southern boundary of the Northern Zone west of Road 1 is similarly replaced with substantial ditch 25015. Although not confirmed in the field, it is possible that the two boundaries are integral and are re-affirmed at the same time. With the imposition of ditch 25021, OA31 is in effect slightly enlarged westwards. However, it is difficult to determine whether or not enclosure ditch 25039 passes out of use and OAs 49 and 31 are amalgamated by this time. These two enclosure labels are retained here as much for ease of reference as anything. 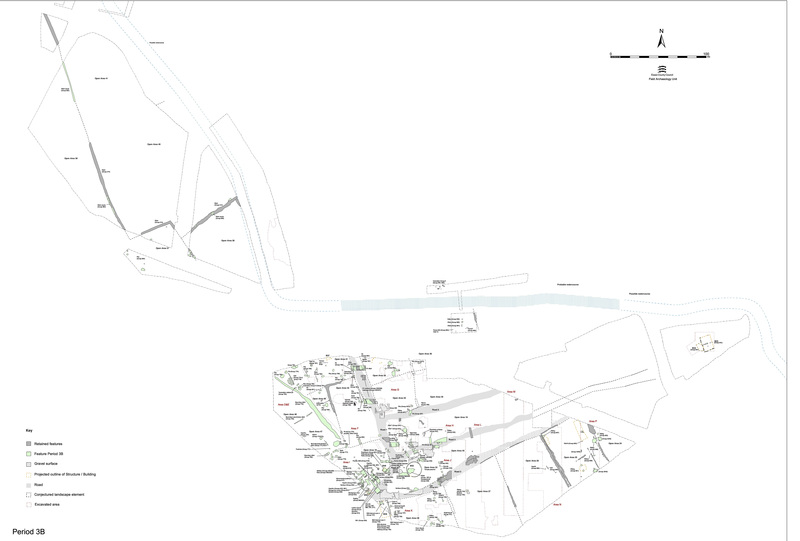 Substantial and extensive ditch 25021 (segs 9067, 9204, 9251, 9325, 9367, 9405, 9476, 9520, 9529) is the replacement of Period 3A-B boundary ditch 25026 - a perpetuation of the major land division that originates in Period 2B. This new boundary ditch is cut along the western edge of its predecessor for much of its c. 100m exposed length. Curiously, at the northern end of the area, it curves to a more WNW-ESE course (slightly less markedly so than the earlier ditches 25018 and 25019, but at roughly the same point northwards). This suggests all these phases of this land division share a common basic orientation and function, even if shifting slightly over time. At its north end it extends beyond the limit of excavation. Its deviation from the line of 25026, although roughly in keeping with the line of earlier ditch 25018 and the posited 'unmarked boundary' between OAs 30/32 and 31 around this point, may also be significant. In effect extending OA31 westward, this newly created space is quickly occupied by a range of features, discussed below. At the south end, its course is obscured within a mass of brown-grey silt deposits, pits and other ditches that are not extensively investigated. However, it may be presumed that 25021 continues southward at least as far as the Northern/Central Zone boundary denoted by ditch 23035 and its Period 3C successor 25015. There does not appear to be any entrance gap at the junction of these ditches, which marks a significant change from earlier periods in this vicinity and may be presumed to be related to the fact that there is no longer occupation per se at this spot. However, the exact southern extent is not clearly defined and it is just possible that 25021 terminates in the vicinity of contemporary pit 9750. As is the case with its predecessor, the ditch fills become increasingly artefact-rich toward the southern end of 25021, with pottery and tile increasingly common, together with slag, glass and worked stone. There is little doubt that it is originally cut in the mid-2nd century, but it may remain in use (perhaps re-cut or at least cleaned out) up to the end of the 3rd century as seen in west of Road 1 (west of ditch 25021) - Period 4 and west of Road 1, Open Areas 31, 32/49 and 47/48 - Period 5. In support of this, it is notable that no other features encroach upon it. 25015 (segs 9303, 9434, 9772, 10491, 10599) is a curvilinear length of ditch replacing the less substantial Period 3B ditch 25035, thus enlarging and extending the boundary between OAs 47/30/32 and OA18 of the Central Zone. 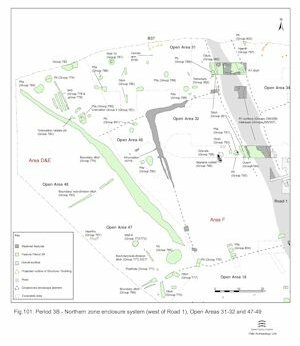 Technically, this ditch should perhaps be viewed principally as the boundary of OA18, but is also worthwhile describing here in terms of the ongoing development of the Northern Zone enclosure infrastructure. As exposed, the ditch forms the rounded north-west corner of OA18, extending beyond the limit of excavation to the south and continuing eastwards to the edge of Road 1. Although generally c. 1.6m wide and between 0.4m and 0.8m deep, it is substantially bigger at its corner, at 3.1m wide and 0.8m deep. It is presumed to follow the same eastward line as its predecessor, but is itself largely truncated by later re-cut ditch 25027. 25015 is evidently a direct and more substantial replacement of 25035, with the modification of a slight eastward shift of c. 4m, possibly to create a new, wider, access between itself and the terminal of 25034 (which is presumed to survive as a boundary in some form or other). Similar to 25021, its fills yield a range of finds of varying dates along its length. These 2nd to mid-3rd century pottery dates vary from one excavated segment to another and may attest to it being open for some time and being filled gradually or episodically along its length. 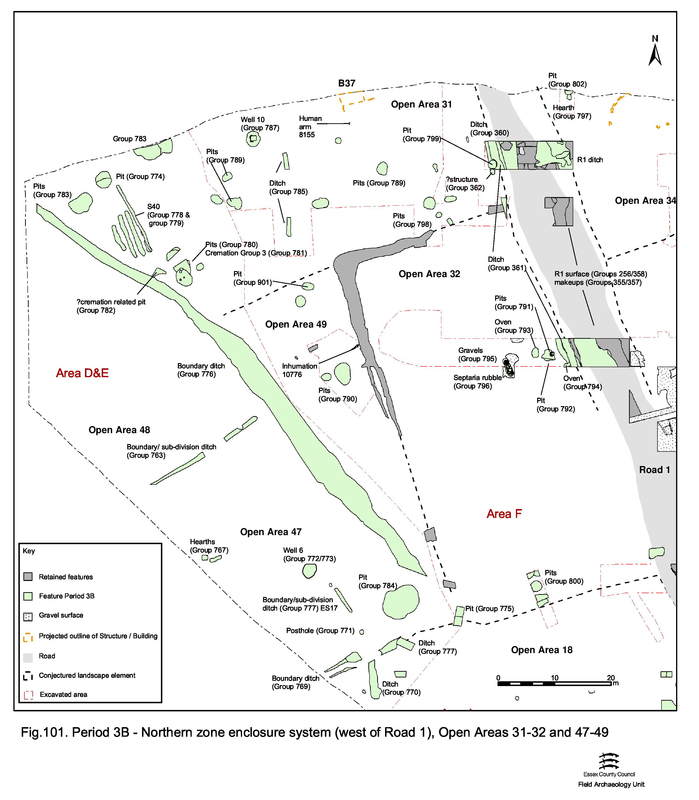 Unlike OA31, the interior of OA47 remains unaffected by the imposition of new boundary ditch 25021, since it closely follows the line of 25026 at this point (Figure 101). 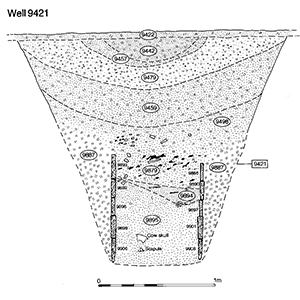 The construction of well 9421 (Group 772) comprises different deposits. The first deposit within the wooden shaft is a grey-brown humic silt 9895, c. 0.73m deep (Figure 126). It contains a complete cow's skull together with scapulae and vertebrae, the handle of a large glass vessel, a complete greyware jar and leather fragments including a complete shoe sole (SF6630) (no. 518). Possible structured deposition is speculated for the presence of some or all of these objects at the bottom of the well. Overlying 0.14m-thick deposit of orangey-brown peaty silt 9894 contains many sticks and twigs with occasional inclusion of pot and bone. Together, these deposits may represent accumulation during a period of abandonment of the well. The 0.45m-thick grey-brown clayey silt 9879 on top of 9894 contains a wooden lathe-turned object (SF6615)(no 167), probably a furniture fitting, and more leather fragments (SF6616), along with 3.8kg of pottery, tile, briquetage, bone, and vegetation remains. The overlying deposit, 9498, though originally recorded as separate, is in fact the non-waterlogged portion of the same. It includes an extraordinary 51kg of pottery; more than half of the well's total assemblage. Above this, deposits 9459, 9479, 9457 and 9442 appear to be post-abandonment fills, their clay component probably deriving from the slumping of the construction backfill (9887) following the disintegration of the upper well planks. Fills 9459 and 9479 are black-brown silts containing abundant pottery, tile and some baked clay/daub and slag. 9457 and 9442 are lesser deposits of gravelly silt that accumulate in the slump hollow that subsequently forms in the well cone. The use, disuse and backfill deposits of the well shaft are all broadly dated to the 2nd century. The condition of the pottery is generally poor, and few closely dated forms are identified. 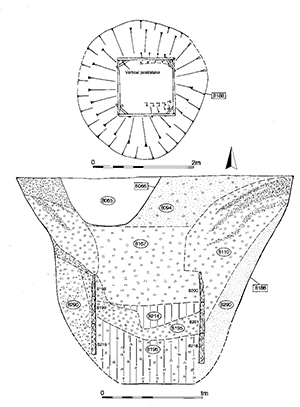 However, the presence of mortaria, supported by a Colchester colour-coated beaker, suggests that principal filling occurs during the second half of the 2nd century AD. Nene Valley colour-coated ware sherds recovered from upper fills suggest that deposition continues into the 3rd century. Large pit 9750 is the only such feature to occupy the OA47 interior, deliberately located in a discrete and peripheral position in its south-east corner. Containing relatively large quantities of pottery, tile and animal bone, its existence suggests a continuing domestic presence at this southern end of the enclosure. Short, but relatively broad, length of slot 25011 (seg. 9423) is the only other obviously mid-2nd century feature in the enclosure. 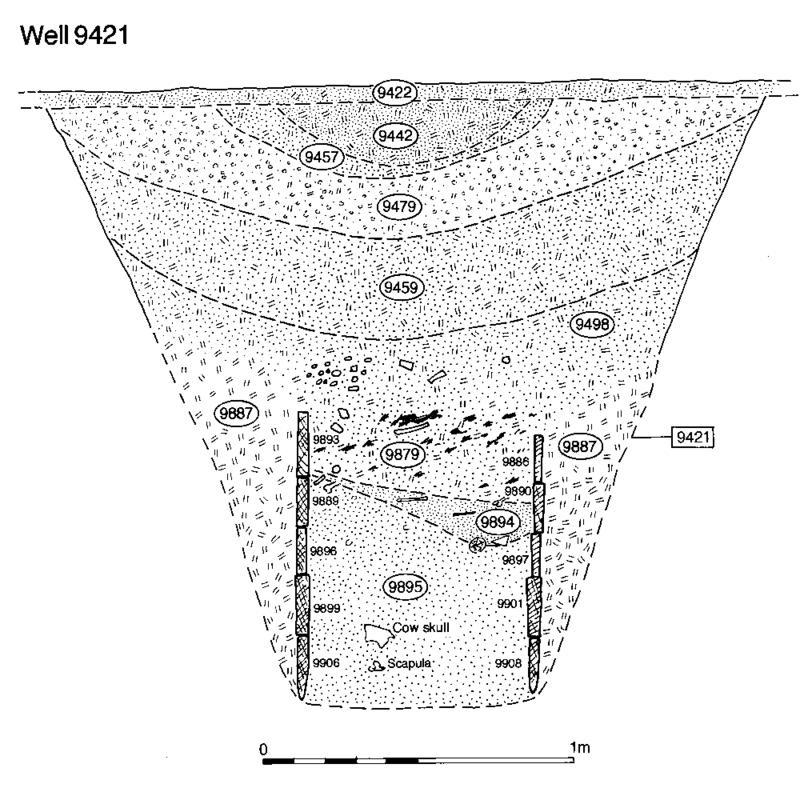 It is possible that its positioning next to Well 6 is significant, perhaps related to its use or even secondary use as a refuse pit through Period 3C and beyond. 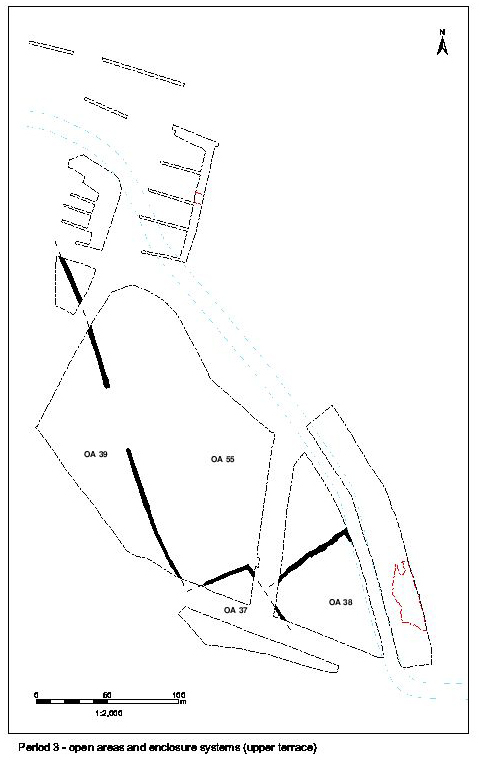 The only impact on OA48 of the modification to the enclosure system is the loss of a small portion of its eastern interior owing to the encroachment of ditch 25021 (Figure 101). The division between OAs 47 and 48, marked in Period 3B by ditch 25029, is presumed to persist into the mid-2nd century. This being the case, OA48 continues to be kept free of intrusive features of any sort. With the replacement of its western boundary by ditch 25021, OA31 is extended to the west. This new space is seemingly quickly and comprehensively utilised and filled with pits, possible cultivation trenches and even burials (Figure 101). Alternatively, these occupying features could perhaps be placed here first and the ditch is subsequently diverted around them. A series of four short parallel gullies or slots, running NNW-SSE, occupy the majority of the 'new' space in the west of OA31. They are equally spaced, at around 0.6-0.8m apart, cut into natural brickearth, with near-vertical sides and flat bottoms. Slots 25000 (segs 9070, 9078) and 25023 (segs 9086, 9102, 9105) are of similar length at c. 8m. It is likely that 25235 (segs 9138, 9132), though truncated by later slot 25025, originally had a similar length. The relative shortness of 25022 (segs 9076, 9090) seems deliberate, judging by the clear definition of its terminals, rather than being due to truncation. All these slots average 0.8m in width with a depth of 0.2-0.35m, though their northern ends tend to be shallower than the southern. The slots contain single fills that vary by feature, from grey-brown to black-brown silty clays. Generally small quantities of finds are present and invariably include pottery, usually a small amount of tile or daub or briquetage (sometimes all three), and the odd nail. Soil sample analysis of those slots with particularly-dark fills has established that this is due to a high charcoal content but, other than a few tiny animal bone fragments, no significant ecofacts are present. Interpretation of their function is difficult, as the four slots are not obviously related to anything else in the vicinity. It is possible that they represent the remains of a structure or they may have been horticultural trenches - though there is no ecofactual evidence to support the latter. Their fills would seem to be rubbish deposits of earlier 2nd century AD date. 25025 (segs 9107, 9134, 9155) is a longer and thinner slot that overlies the most easterly of the four parallel slot features, 25235. While it could be interpreted simply as a replacement of 25235, it is on a slightly different alignment, which would seem to suggest that this is a more significant, though not unrelated, change that takes place after the four parallel slots pass out of use. No obvious function suggests itself, although the foundation of a screening fence may be possible. Large pit 9630/9391/9663 (Group 780) is cut into the fills of defunct Period 3B boundary ditch 25026 and contains a number of successive re-cuts, as well as four cremation burials inserted into it (see below). This pit may be regarded as another of the infill features of the 'new' space created at the west end of OA31. Triangular-shaped pit 9366 (Group 782) measures 1.96m long and 0.5m deep, and is of mid-2nd century AD date. It appears to be squeezed into the space in between ditch 25021, pit 9630 et al. and the four parallel slots. It is tempting to speculate that this curiously shaped feature has a pyre-related function and is therefore associated with the nearby cremation burials, but its contents do not support this. Its finds include a Millstone Grit quern fragment and a little pottery and animal bone, but nothing else of note. OA31 also contains a modest scatter of small- to medium-sized pits across its interior (Group 783: 9007/9170, 9014, 9015, 9029, 9165, 9189, 9270, 9275, 9594, 9595, 9635). 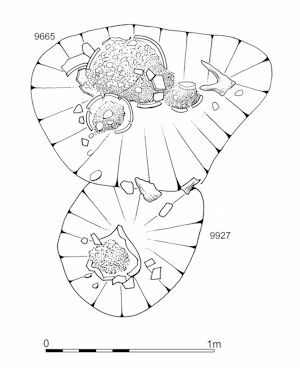 Of these, westernmost examples 9007/9170 and perhaps 9015 could be a part of the same infilling of the newly created space as those features described above. The mid-2nd century pits are clearly more numerous than those of sub-periods 3A and 3B, though this may simply be a function of the easier determination of their dating. The majority are large and oval to irregular in plan, averaging 3-4m at their widest extent and surviving to depths of between 0.4 and 0.8m. Generally of mid-2nd century date, deposition in some might run into the later 2nd century. Some, such as pits 9007 and 9391 are evidently re-cut. A few are cut into the tops of significantly earlier features, the locations of which may still be visible at this time (e.g. 9015). The smaller examples of these Period 3C pits, such as 9165 and 9270, tend to be isolated. The artefact assemblages from these later pits are generally larger and more varied (e.g. pits 9007 and 9029), including significant quantities of building materials such as tile. 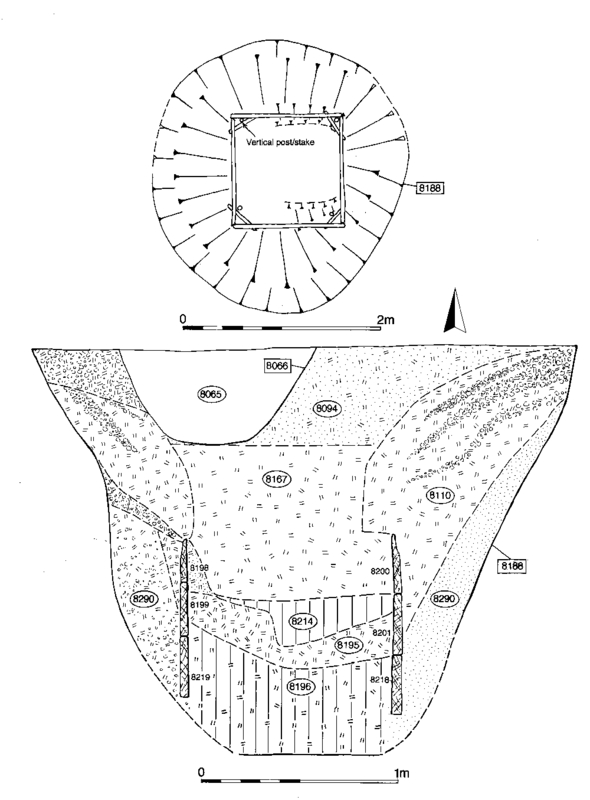 Pit 9014, an oval cut 2.3 x 2.3m and 0.41m deep, contains two near-complete vessels (a dish and jar) within its upper fills, probably representing a structured deposit - perhaps denoting some sort of closure rite. The presence of remains of a glass vessel, lead off-cuts (SF1528) and copper-alloy rod (SF1542) might also be significant. Pit 9029, stratigraphically above pit 9189 and below pit 9014, contains KPG24; dated to c. AD 140-160. 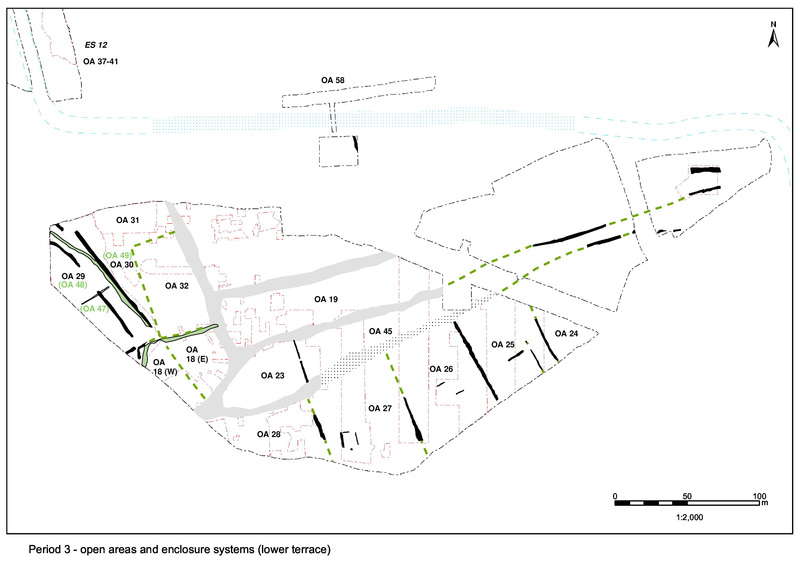 It remains possible that some of the more broadly dated early Roman pits in OA31, particularly those further east, also belong to the later Period 3B. Pit 10151 (Group 799), investigated in the Excavation Area F 'Haul Road Trench', is cut into the fills of roadside ditch 25244 and its re-cut, and serves to show the western limit of Road 1 in the early Roman period. A group of four cremation burials is inserted into the fills of large pit 9391/9630, itself cut into the fills of the Period 3A-B boundary ditch 25026. These features (particularly 9927 and 9928) are disturbed by deep wheel ruts during the stripping of the site. Burial pit 9665 contains an assemblage of two jars and a beaker (Figure 129). One of the jars holds c. 1300g of cremated human bone (Sample 426). Burial pit 9927 is a sub-rectangular cut containing a single jar that contains 1120g of cremated bone (Sample 362) and nine iron nails (Figure 129). Burial pit 9928 is a small oval cut containing the remains of a single jar holding 750g of cremated bone (Sample 360) and a single nail. 9329 is an apparently un-urned cremation burial in an elongated oval pit. The dark, burnt, fill (Sample 384) includes a small quantity of burnt bone concentrated at the north end of the cut. Together, these burials constitute a small group apparently deliberately inserted into the soft fills of the large pit, which is perhaps still evident at this time. However, this may have been incidental - with the burials simply being positioned in the 'new' and peripheral space within OA31. 25037 is an apparently isolated north-south aligned ditch, 0.6m wide and under 0.3m deep. 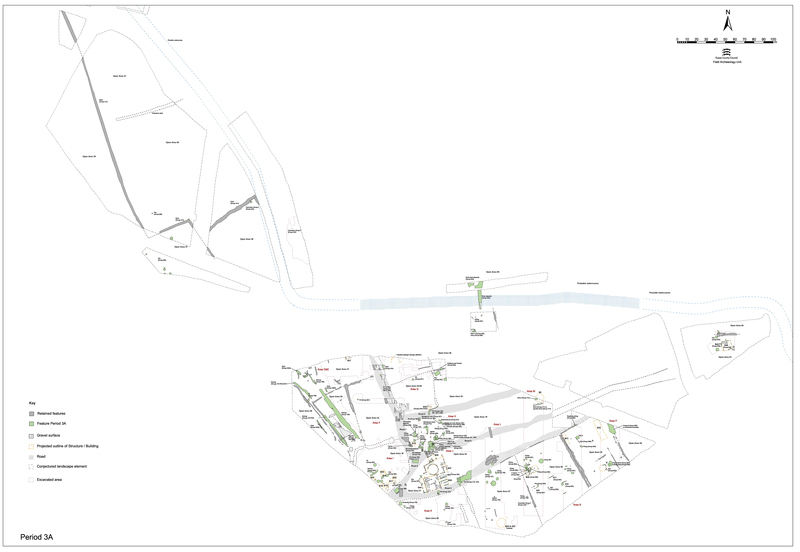 Although cut by substantial later Roman pits, it is traced for a distance of 24m and a terminal at its south end is identified. Its fill contains mid-to-late-2nd century AD pottery and 1.4kg of tile. The contrary alignment of this ditch to all other Roman features in the vicinity makes its interpretation difficult. Its line alone suggests it might relate better to the Period 2B system rather than anything so late. However, the location of its south end at least suggests that it could fit in to the pattern of land division that exists across the Northern Zone in this period. Slightly oval construction cut 8188 is cut through natural brickearth and into gravel to a depth of 2.09m (reaching to 0.75m OD). The cut contains a centrally positioned timber box-lining c. 1.15m square (Figure 103). It survives below the present water-table to a height of three planks. The planks are tangentially-sawn oak, each averaging 0.26m wide and jointed with single dovetails at either end. Corner braces survive on the two upper surviving courses. In addition, vertical posts are inserted at two corners to help support the structure. The construction cut is backfilled around the well lining with a clay deposit that contains several lenses of gravel and occasional finds. Dendrochronological analysis of the timber lining gives a felling date of winter AD 159-160 (see 5.1). The mid/late 2nd-century pottery collected from the construction backfill is therefore of a comparable date. A parallel for the insertion of 'retaining posts' may be found in Well 4162 at nearby Chigborough Farm (Wallis and Waughman 1998, 94), although this example is late 3rd to early 4th century. The well shaft contains a sequence of waterlogged fills. Primary fill 8196, potentially a use accumulation, is a peaty clay containing wood fragments, tile and animal bone, though little else in the way of cultural debris. Most significantly, among the wood fragments are a wooden 'sword' (SF2758) and 'spatula blade' (SF7603). Its period of use is judged to be confined to the mid/later 2nd century. The subsequent disuse and backfill deposits within the well date to the late 2nd to early 3rd centuries. As such, their nature and artefactual content are described elsewhere). Indeed, the presence of thirteen tile tessera in primary fill 8196 may hint that all accumulated material in the well in fact dates to the mid-Roman period. This group of pits, which occupy the eastern part of OA31, are only broadly dated to the Early Roman period (Period 3). Pit 10026 appears to comprise several episodes of deposition, and perhaps re-cutting, each with a lining layer before the main rubbish deposit (or perhaps more likely a capping layer after). The early lining is of orangey-brown clean, unmixed clay (10051), and a later lining of gravel (10025). This 2m-diameter pit was not bottomed because of the high water-table, but was at least 0.55m deep. Its profile was similar to features elsewhere that turned out to be wells, although it may be a little smaller than most of those, and the that were excavated contained nothing like the quantity of finds common to other wells. It may originally have had a purpose unrelated to the rubbish deposits that finally filled it. These pits define a 2nd-century period of activity across this area of the site. While most of the pits contained relatively large amounts of pottery, those more closely dated to the mid-2nd century may be typified by the presence of tile in moderate quantity. Other types of find remain rare. Unlike OA31, the interior of OA49 remains unaffected by the imposition of new boundary ditch 25021, it closely following the line of 25026 at this point (Figure 101). Its southern boundary is reinforced with the replacement of ditch 25035 by 25015 and its somewhat notional northern extent/interface with OA31 is presumed to endure. Indeed the northern end of ditch 25008 (see below) and the southern terminal of OA31 ditch 25037 may serve to help locate this otherwise unmarked boundary. Pit 9358 (Group 901) is a pronounced oval in plan, c. 2m long and 1.3m wide. It is relatively deep, at 0.8m, with near-vertical sides and a flat base. It contains the remnants of what appears to be a lining of tile fragments across its bottom and around the sides, suggesting that this is not a simple rubbish pit. It seems to be deliberately backfilled with silty gravel before being reused in Period 4 (see 9243). This subsequent reuse makes interpretation of its original function impossible. Later Period 3 pits 8165, 8247, 8269 (Group 790) are circular to oval cuts of moderate size, averaging a width of 2m, although 8269 is larger at 4.1m x 2.5m. Most are steep sided and flat bottomed. Pit 8165 is an apparently isolated circular pit, relatively deep at 0.53m. It contains traces of a possible clay lining, along with pottery, a small amount of baked clay and a glass jar handle. Its proximity to lined pit 9358 may be significant. Large pit 8269 displays a prolonged, two-phase, sequence of infilling that extends into Period 4, while pits 10023 and 10044 appear to be deliberately re-cut in this later period - again, reminiscent of pit 9358. It is noted that relatively little of the OA32 enclosure interior is investigated (particularly across its eastern half within Excavation Area F) and that this has inevitably limited and skewed understanding of its content (Figure 101). Most investigated features are located toward the enclosure peripheries. Parallel linear arrangements of septaria rubble 10266 and 10278, were originally viewed in the field as the likely remains of wall footings denoting a building fronting onto Road 1, and were therefore the major reason for the location of the North Trench in this part of Excavation Area F. However, both were established to be distinct dumps within the fills of slot-like features 10382 and 10392. 10382 is a short shallow slot only 3.3m long, parallel to Road 1 at some 12m from its edge. Septaria rubble deposit 10278 extends along much of its length. Though indeed parallel, 10392, as described above, is in fact a re-cut of roadside ditch 10565, within which septaria deposit 10266 is a fill extending only 2.5m along its length. 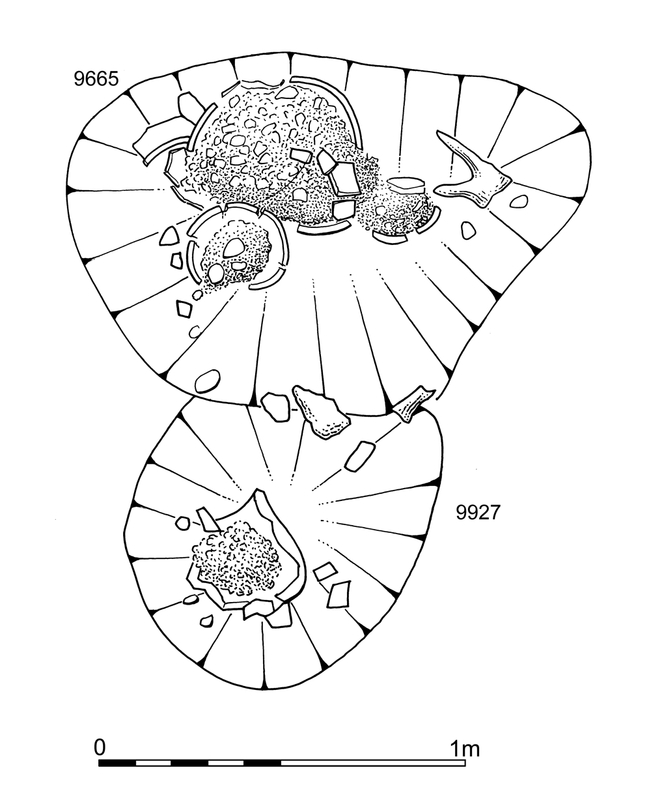 Consisting exclusively of septaria, these highly selective deposits are presumably used as deliberate infill. It is likely that they are contemporary with one another and perhaps hint at the need for substantial reinstatement of the ground surface at these particular locations. Little useful insight into the nature and distribution of Period 3C disposal can be gained. Some of the pits already discussed as occupying OA32 during Period 3A and Period 3B could in fact relate to the mid-2nd century use of the enclosure.